History, Characteristics of Cubist Painting, Collage, Papier Colles. Following the phases of Early Cubist Painting and Analytical Cubism, the third and final act of the Cubist collaboration between Georges Braque (1882-1963) and Pablo Picasso (1881-1973) occurred during the period 1912-14. Known as Synthetic Cubism, this symbolic style of art is more colourful than the earlier analytic form of Cubism, incorporates a wide variety of extraneous materials, and is particularly associated with Picasso's novel technique of collage, and Braque's papier colles. The Spaniard Juan Gris (1887-1927) was a major contributor to the new style. If Analytical Cubism provided a revolutionary painterly alternative to single point linear perspective, Synthetic Cubism was equally innovative in its use of collage and papier colles, both of which bridged the gap between life and art by inserting pieces of the real world onto the canvas. They also highlighted the fact that a painting is a two dimensional flat object and blurred the line between painting and sculpture. It had a notable influence on later movements such as Dada (c.1916-24) Surrealism (1924 onwards) and Pop Art (c.1960-75). Picasso's synthetic Cubism coincided with his move from Bohemian Monmartre to Montparnasse, and ended with the outbreak of war in Autumn 1914, shortly after which Braque left to fight and Daniel-Henry Kahnweiler (the duo's main art dealer) fled to Switzerland. As a Spanish neutral, Picasso was free to continue his painting career in Paris. In due course he was represented by Paul Rosenberg (1881-1959), younger brother of the Cubist dealer Leonce Rosenberg (1879-1947). This new synthetic form of Cubist art reversed the compositional principle of Analytical Cubism. Instead of breaking down an object into fragments and then re-assembling them (Analytical Cubism), the image was being built up (synthesized) from new elements and shapes. The two main techniques they used were collage (from the French "coller", meaning to stick) and papier colles (from the French, meaning pasted paper). The new type of modern art emerged in two particular works. In The Portuguese (1911, Kunstmuseum, Basel), Braque had introduced the use of stencilled lettering, and in the following year he began to experiment with mixing materials such as sand and sawdust with his paint, in order to create interesting textures. Picasso produced his first collage (Still Life with Chair-Caning, 1911-12, Musee Picasso, Paris), in which he incorporated a piece of oilcloth and a length of rope whereupon Braque responded by pasting pieces of printed or decorative colour paper onto his paintings in much in the same way as a collage, except the shape of the pasted papers were objects themselves. He first used papier colles in Fruit Dish and Glass (1912, private collection). This process of incorporating scraps of everyday materials (newspaper cuttings, tickets, tobacco wrappers etc) into their paintings, marked a move away from the austere intellectualism of Analytical Cubism, towards a more relaxed and whimsical set of aesthetics. The theory was that, by introducing physical elements of real life, paintings would become more 'real'. In addition, the use of commonplace bits and pieces of daily rubbish was a deliberate attack on the superior image and high-mindedness of fine art. The inclusion of these items suggested that art could be made with scissors and glue as easily as with brushes and paint - a liberating and most unconventional approach for those days. The chosen genre was, for the most part, still life, and one overt consequence of their concern with greater surface richness, was that Braque and Picasso (and especially Juan Gris) reintroduced colour to their painting. Both artists were delighted with their fake textures and surfaces. Picasso in particular used collage to amuse spectators with witty transformations of everyday objects, and took full advantage of the whimsicality of the medium. 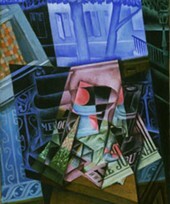 Although he had co-invented Cubism to make a serious point, one feels that his puckish sense of humour prevented him from taking the movement as seriously as (say) Apollinaire, or Albert Gleizes and Jean Metzinger, whose book Du Cubisme (1912) had helped to establish Cubism as an ultra-intellectual type of art. After all, simply pasting bits of rubbish onto a painting did not inevitably make it more real. Indeed many materials were used to create an illusion of reality, the very thing that Picasso and Braque had criticized traditional fine art for, in its reliance on single point perspective. In general, however, most art critics treat Synthetic Cubism very seriously and read enormous significance into its use of non-art materials. They see the style as the starting point for a number of junk art movements and anti-art schools such as Dada. Analytical Cubism tended to lose sight of expressive values except by standards too esoteric to mean much to anyone not absorbed in the movement. Also the painters' stylistic individuality had been somewhat fettered. But Synthetic Cubism turned each painter loose to find his own way within the vast general field of free invention along Cubist lines that was now opened up by a new way of conceiving form. Colour now returned in force, sometimes related to the natural colours of the formal motifs, sometimes arbitrary. The shapes of objects were used as a basis for improvisations, inventions, ambitious or playful compositions in every combination and recombination of abstract shapes invented imaginatively, subject to no rule or theory. If Analytical Cubism was all about the 'taking apart' or deconstruction of objects, Synthetic Cubism was all about their reconstruction or 'synthesis'. It was at this stage in the development of Cubism that Juan Gris came into his own as the poet of the movement. Juan Gris (1887-1927), born Jose Victoriano Gonzalez, was like Picasso a Spaniard who had put the academic routine behind him in his own country and had come to Paris at nineteen. NOTE: For an interpretation of some of the great Cubist pictures by Picasso and others, see: Analysis of Modern Paintings (1800-2000). In Gris's typical Dish of Fruit (1916, Philadelphia Museum of Art) it is easy to recognize the general shape of a compote with its base, neck, and bowl and to identify a couple of coloured shapes as pieces of fruit. The tabletop and even something like the bowl's shadow, to the right of the base, are also recognizable. The rectangular shape defined by a triple outline in the background might be a repetition of the table form or might have been suggested by a napkin or doily. Or it could be a picture frame on the wall. None of the forms needs be recognizable in specific detail, but each has been played with inventively and the shapes have been coloured most ornamentally to produce a combination of forms and colours that would not have been reached without the preliminary puzzle-solving of Analytical Cubism, but now branches away from it. In The Open Window (1917, Philadelphia Museum of Art), it is possible to see that the window, or what we could call a French door, is opened onto a balcony with a tree beyond it. We can even tell that the long double doors are three-paned. Along the left hand side of the picture the left door is represented with comparative realism. On the right, the forms are more broken, but a piece of cloth patterned in large dots and gathered across the lowest pane is immediately recognizable. The picture is filled with gentle, quiet mood, retaining as it does the connotation of a pleasant room with a window opening out to trees, and composed as it is in simple shapes dominated in colour by soft blues, greys, and modified whites. In Synthetic Cubism, shapes and colours may be determined by the painter's sensitivity alone; thus painting has returned to the old basis, the painter's reaction to the world and his interpretation of it in coloured forms. But it has returned with a new vocabulary, a vocabulary more flexible than Analytical Cubism had promised. Synthetic Cubism leaves the painter unfettered by anything except the limitations of his own inventive ingenuity. Although to a novice all Cubist paintings may look alike, and the idea of any one form of Cubism being more poetic than another may seem absurd, Gris's poetic quality becomes apparent when the surface similarities of all Cubist paintings are scratched. Even when he was working more analytically, Gris always insisted that a high degree of recognizability should be retained in a painting, in spite of the fact that the artist was involved in the Cubist shattering and reassembling of forms to create new structures. In the hands of Picasso and Braque, Analytical Cubism had abandoned the appeal of subject, the response to the world, which had been the basis of Impressionism and had been continued, with variations, in the work of Cezanne, Gauguin, Van Gogh, and Seurat. Subject matter was instead reduced to a small list of motifs closely connected with the studio or with the cafe as an adjunct of the studio, such motifs as tables with bowls of fruit and glasses of wine, a few musical instruments, and posed models. But Gris frequently invested these motifs with more personal associations. The Open Window is one of several recollections of his quarters on the Rue Ravignan where a group of writers and painters inhabited a disreputable old building called the Bateau-Lavoir. Picasso lived there for a while. For Paris's exponents of avant-garde art, the Bateau-Lavoir became a kind of club, taking its place in the tradition of Courbet's Brasserie des Martyrs and the Impressionists' Cafe Guerbois as a centre where ideas were formulated and discussed. But the associative interest of The Open Window is not enough to account for the poetic feeling that permeates it. This feeling is present in Gris's art even when the pictures are composed of the usual Cubist list of motifs, as in The Violin (1916, Kunstmuseum, Basel). Typically the colour is gentler, the forms are more placid, their combinations more serene than those of Gris's fellow Cubists, and from these abstract elements, rather than in specific evocative elements, Gris's poetry lies. He is Cubism's Corot. Here is a short list of some of the best works of Synthetic Cubism by Pablo Picasso, Georges Braque and Juan Gris. Still Life with Chair-Caning (1911-12) Picasso Museum, Paris. Musical Instruments (1912) Hermitage Museum, St Petersburg. Clarinet and Violin (1913) Hermitage Museum, St Petersburg. Composition with a Sliced Pear (1914) Hermitage Museum, St Petersburg. Composition with a Bunch of Grapes and a Sliced Pear (1914) Hermitage. Woman Wearing a Shirt and Seated in a Chair (1913-14) private collection. Tavern (1914) Hermitage Museum, St Petersburg. Glass Dice and Newspaper (1914) Musee Picasso, Paris. Pipe, Glass, Ace of Clubs, Bass Bottle, Guitar, Ma Jolie, Dice (1914) Berlin. Violin (1915) Musee Picasso, Paris. Harlequin (1915) Museum of Modern Art, New York. Man with a Pipe (1915) Art Institute of Chicago. Woman with a Guitar (1915) Norton Simon Fund, Los Angeles. Three Musicians (1921) Museum of Modern Art, New York. The Portuguese (1911) Kunstmuseum, Basel. Fruit Dish and Glass (1912) private collection. Woman with a Guitar (1913) Musee National d'Art Moderne. Bottle, Newspaper, Pipe, and Glass (1913), Private collection, New York. Clarinet (1913) Peggy Guggenheim Collection. Violin and Pipe (1913), Musee National d'Art Moderne, Paris. Young Woman with a Guitar (1913), Musee National d'Art Moderne, Paris. Glass, Carafe and Newspapers (1914), private collection, Basel. Still Life on a Table (1914), Musee National d'Art Moderne, Paris. Still Life (1914), Art Institute of Chicago. The Violin (1914), Cleveland Museum of Art. Dish of Fruit (1916) Philadelphia Museum of Art. The Violin (1916) Kunstmuseum, Basel. Fruit Dish, Book and Newspaper (1916) Private Collection. The Open Window (1917) Philadelphia Museum of Art. For works by other Cubists, like Fernand Leger (1881-1955), Robert Delaunay (1885-1941), see Cubist Painters.  For a list of schools and styles, see Modern Art Movements.